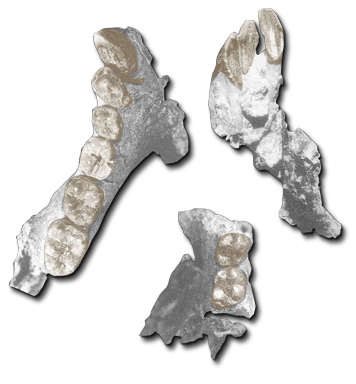 Originally designated to the genus Kenyapithecus, E. africanus was a large and sexually dimorphic hominoid. Equatorius possesses a suite of primitive and derived anatomical traits. According to Ward, et al., “Primitive postcranial features attributed to E. africanus (which are shared with both Proconsul and Afropithecus) include a relatively broad and flat sternum, a posteriorly oriented and flattened humeral head, and position of the zygapophyses provided for a long and flexible vertebral column. All three genera show the same dental formations as well: low crowned mandibular canines with medially converging roots, a mandibular molar size sequence of M1 < M2 <M3, and a U shaped dental arcade.” Derived anatomical features are centered around the formation of the shoulder and elbow joints. According to Hartwig, “The scapula is short along the vertebral border, when compared to the length of the axillary border, and the acromion process projects beyond the glenoid region. The clavicle is very robust and relatively straight. The proximal ulna articulates with the olecranon fossa via a strongly buttressed coronoid process and long olecranon process.” Examinations of the lower extremities shows a femur with a long and high angled neck, short femoral head, a broad and thin patella, and a robust hallux. 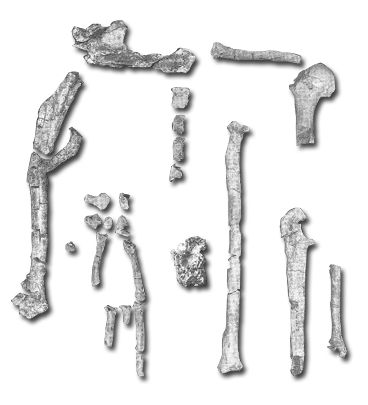 This species diverged after Proconsul and Griphopithecus but prior to the last common ancestor (LCA) of Sivapithecus, great apes, and humans and is widely regarded as the earliest known member of the great ape and human clade (McCrossin and Benefit).